Competence team `Biological Drinking Water Quality´ - guenter-gunkel2s Webseite! The competence team `Biological drinking water quality´ is a multi-disciplinary co-operation of specialists in the field of drinking water. Implementation of training and continuing education measures concerning occurrence of small invertebrates in drinking water networks and pipe network maintenance. Berlin University of Technology, is online available, download >>>. The research and evaluation of small invertebrates in drinking water networks includes non-visible amoeba and ciliates (micro-invertebrates, < 0.5 mm), nematodes, copepods and water fleas (meiofauna, 0.5 -. 2 mm) and macro-invertebrates that are visible to the naked eye such as water lice, bristle worms (oligochaete) and midge larvae (chironomidae). Water lice represent an aesthetic problem in the drinking water supply, and hygienic impact can occur by faeces of the animals (the faeces is very stable) and by dead animals. Increasing water temperatures and a decreasing water use are triggers for an increased development of water lice in pipe lines and require an intensification of the monitoring and the pipe network maintenance. 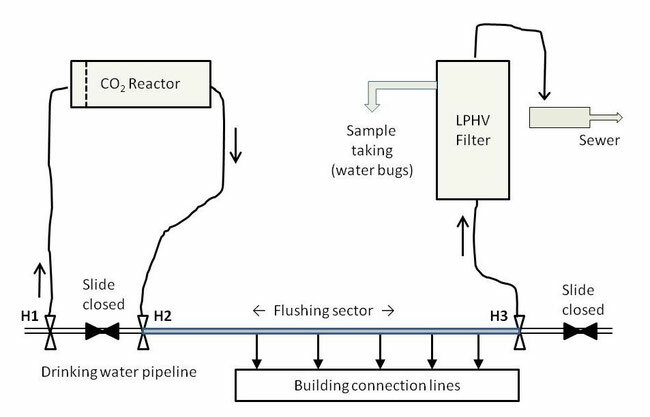 The monitoring of the colonization of drinking water networks by small invertebrates can be done using hydrant samples, 1 m3 water with a flow rate of > 0.5 m sec-1 must be abstracted. The animals are gently separated using a low pressure-high flow rate stainless steel filter with a mesh size of 100 µm, and the samples are analysed by a microscopy technique. The evaluation and classification of the abundance of small invertebrates is done by statistical methods using a data bank of 1039 actual data sets from hydrant sampling. (3) mass development (= intervention range). This evaluation is currently under application to different species. Actual we are calibrating this evaluation. The newly developed CO2 flushing method is very successful in elimination of water lice from drinking water networks, here CO2 enriched water is injected into a pipe section to sedate the animals and flush them out. The CO2 enriched water is generated in a CO2 reactor. At the exhausting hydrant a big low pressure-high volume filter with 100 µm mesh ize is operating to separate the macro-invertebrates for control and evaluation of the number of organisms, which had been in the pipe, as well as to prove a sufficient elimination of the water bugs. The flushing with 2 – 3 times of the pipe volume is sufficient to remove nearly all (> 98 %) water lice. This flushing method has been awarded the Professor Adalbert Seifriz Award (2013) and the Zenit Innovation Award (2015). The CO2 flushing method is continuously further developed (application to large pipes, reduction of the CO2 consumption, and comparison with other flushing technologies). Scheideler, M. & Gunkel, G. (2015) Trinkwasseruntersuchung mit System – Die neue INWERT®-Methode. 3R, 10-11, 69-74. Michels, U., Gunkel, G., Scheideler, M. & Ripl, K. (2013) Invertebraten im Trinkwasser - Probenahme, Analytik und Bewertung. Universitätsverlag der Technischen Universität Berlin, ISBN 978-3-7983-2575-3, 98 S.